Do Cats Get Jealous of People? Cats are not shy about exhibiting emotions like jealousy. While cats can be jealous of other house pets, a newcomer may cause your kitty to turn into that green-eyed monster. If your cat is jealous of other people, there are steps you can take to mellow her attitude around the new person. While not always, frequent causes of jealousy toward people are new folks coming into the home. If you have a baby, get a new roommate or have a boyfriend over a lot, Kitty sees this as taking time away from her. She has to share you and this creates jealousy. If you have multiple cats, one jealous kitty may cause the others to act out too. Some cats sulk or start to avoid attention when jealous. Jealousy can also turn into aggression. 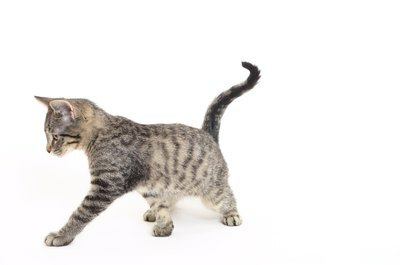 Kitty may act nippy toward you or the new person, biting your hand or swatting at you. Or she may urinate in the home even though she's litter box trained. Banishing Kitty from the room or otherwise punishing her can make things worse, as you are further depriving her of attention. To ease the introduction to new folks, spray their pants or shoes with your favorite perfume or a feline pheromone spray, which can make the newcomers smell like you. Ask your friend to spend time playing with the cat using her favorite toys or to feed the cat. As they bond, Kitty will become less jealous, and before you know it, they'll be cuddling together. When you are all together, throw your cat treats to reward good behavior and keep her engaged. You may decide Kitty needs a feline playmate to compensate for your divided attention. When picking out a companion for Kitty, look for a cat around the same age so their energy levels mesh. Introducing a new pet can cause jealousy, but may ultimately help a jealous cat to feel more secure. CatChannel.com: Would a Companion Cat Stem My Cat's Jealousy?